In the video on this page, expert and online Osteopath Tim Judd explains the triggers to knees and thighs problems, how the knees and thighs functions and the reasons for discomfort and pain in men and women. Now that you understand what causes knee pain and thigh problems and how to prevent the most common knee and thigh problems, it is time for targeted exercise to improve the range of motion. Click here for a sample of just one of the 18 Knees and Thighs Stretches available to you. For immediate relief of knee joint and thigh muscle pain, tension, or stiffness and fatigue, go here for the Essential knee and thigh Exercises that can relieve stiffness and discomfort, or add to cart now. 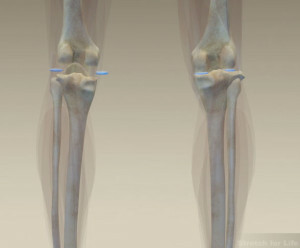 Learn about knees and thighs pain and knee joint and thigh pain relief through medical anatomy and 3D animation. What causes chronic knees and thighs problems? What are the most common knee and thigh conditions? What is the iliotibial band (ITB)? What is iliotibial band syndrome? What is a bakers cyst and what causes it? What is the patellofemoral syndrome? What is the relationship between your hips, thighs and knees? 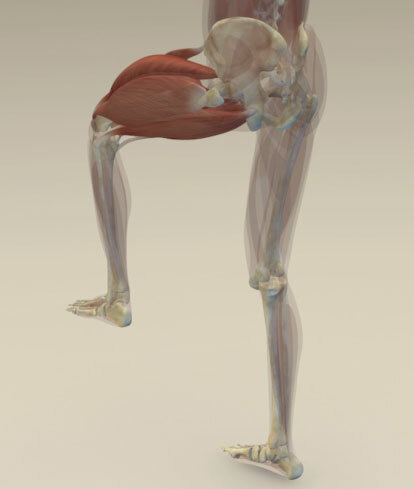 What is the function of the vastus lateralis muscle? How do you stretch your knees and thighs for pain relief and for releasing tension? 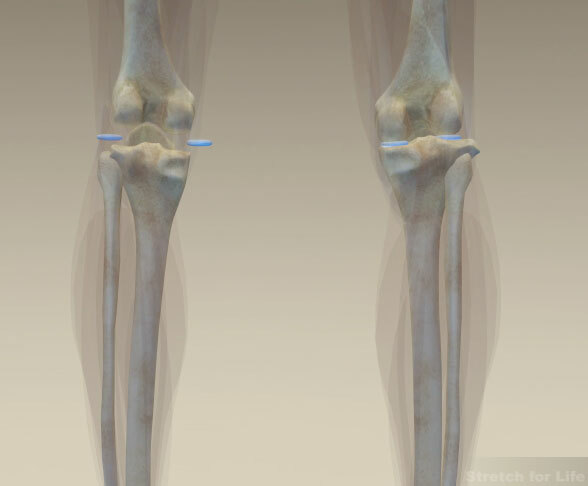 The knee joint is like two long bones with roundish ends stacked on top of each other with a couple of cartilage washers in between taking up the slack. Ligamentous straps hold it together and the muscles that come down from the thigh, wrap around the knee and attach to the lower leg. Muscle pain typically presents in the belly of the muscle or where it attaches to the bone. Often when we feel a painful joint it isn’t actually the joint, it is the tightness of the muscle pulling at its attachment point, which is in close proximity to the joint. So, if you have pain on the inside of the knee it is probably excessive tension in the Adductor group – the muscles on the inside of the leg. Pain above, below or under your knee cap is likely from excessive tension in the Quad group. Pain at the back of the knee can be the result of hamstring tension or a Bakers cyst. Pain on the outside of the knee can be excessive tension in the ITB. Cartilage disc or ligament damage can be another reason for pain in the knee. The muscles and ligaments of the thigh and knee tend to weaken gradually over time, especially if you work in an office or are relatively inactive. Inherited increased ligament elasticity, sports injuries and repetitive activities such as yoga, gymnastics and dance can also lead to weak knee joints. These activities or in-activities typically destabilize the knees making them more prone to injury. The use of elastic or neoprene knee supports will also help the unstable knee joint. As always there are a number of possible components that can be affected. The cartilage of the knee might be worn or damaged causing pain, clicking or even locking of the knee joint. There may be arthritis in the knee. The muscles of the thigh might be too weak or have too much tension in them to allow good mechanics, which will result in pain and inflammation. This is common in teens with growing pains. It’s hard to understand but bones can grow faster than muscles can stretch. This increase in muscle tension increases the drag on the muscle attachments causing inflammation around the joint as well as putting a lot more compression on the joint surfaces. Because of the muscle crossover, the problems can spread up into the pelvis, hips and lower back or problems can refer down from there. There are many possible causes of pain and discomfort in the thigh and knee region so if you are not sure of what is going on then you need to seek medical diagnosis from your Osteopath or Doctor. Then you can confidently carry on with the full Stretch for Life home program. Good posture can also benefit this zone. Two Set Lower Body & Upper Body DVDs for total body relief, repair and maintenance. Learn more here. To read more from Tim’s Blog click here. To check out Tim’s Auckland practice click here. For information about conditions that affect the Knees and Thighs click here.